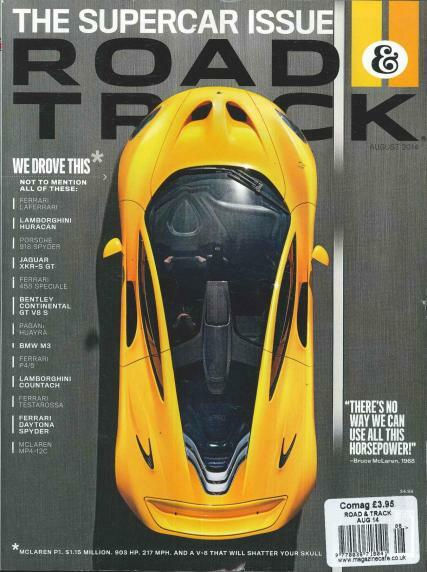 Road and Track Road and Track is a monthly automotive magazine published in the United States. Contains information about cars and driving and includes road tests on sleek and stylish cars. It does the excellent job of covering both national and international car scenes and providing a test summary of cars typifying it from the gang of such types. The wider format of its pages and bigger size glossy pictures are preferred by the common public for their convenience. The reviews of cars mentioned in it counsel you to fix upon the best car for purchase. It keeps the car - lover updated with the features and elements of the latest cars. The reviews concerned with the public appeal for cars are presented in biased form with full authenticity. The topics under its coverage also include the racing car events which is a general awareness that one must have. It broadcasts all the best in high - performance vehicles with articles focusing on areas such as aerodynamics, suspension and which cars have the most powerful engines. They literally test the cars and bring out the pros and cons against cars from their standpoint which would not be provided by the dealer even.